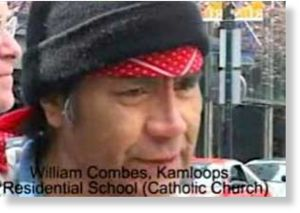 The nurse, using the pseudonym Erika Kelly, was the attending staffer responsible for William Combes after he was involuntarily and forcibly admitted by the RCMP to St. Paul's Catholic hospital shortly before his sudden death on February 26, 2011. Combes died on the verge of his scheduled appearance before a human rights Tribunal in London, England where he was to testify about his witnessing of the disappearance of ten Kamloops Indian residential school children while in the company of Queen Elizabeth and Prince Phillip on October 10, 1964. "I deal with TB cases all the time, and he had none of its symptoms, no coughing, no fever and no sputum, and he was not under any quarantine provisions " stated Kelly in a summary statement. "A lot of things didn't make sense. His discolored urine, severe abdominal pain and skin pallor indicated a severe toxic infection but he wasn't on an IV and wasn't getting any antibiotics. He had a lumbar puncture on his spine but there was no order for an LP nor did any appear on his chart. There wasn't even a patient transfer form for him or any of the normal paperwork, and later I learned they'd even used a false name for him. When I mentioned all this to the CNL (head nurse) she ignored me and did nothing about it." "They were both really official looking. I didn't like them, they actually scared me. They were very aggressive and asked me very pointed questions that didn't fit with a care planning session, like what he'd been saying and what his mental status was. I objected to them about the way William was being treated and they abruptly dismissed me and later that day I was taken off his case by the CNL. The next day William was dead. All his symptoms indicated that he had arsenic poisoning, especially in combination with the abdominal pains, the dark lines on his fingernails and the papules on his skin. So the Coroners' report doesn't make any sense. I absolutely disagree with it, there's just no way it can be true." Erika's testimony has been entered into the Citizen's Grand Jury's case file concerning the ongoing murder of aboriginal people on Canada's west coast. Additional evidence of the traditional use of St. Paul's Catholic Hospital as a medical killing ground for aboriginals is being documented by the Grand Jury and will be part of their report when it is publicly issued in the spring of 2019. The Citizens' Grand Jury was convened last September by international jurists to investigate the ongoing disappearance of aboriginal families on Canada's west coast. Its mandate includes the power to convene a Common Law Court trial that will issue subpoenas and Summonses to top officials of Canadian Church, State and Corporations. To contact the Grand Jury with evidence or for more information write to disappearedofcanada@gmail.com . 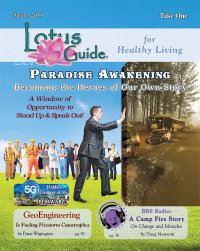 This Communique is issued by the West Coast Citizens' Grand Jury, a subsidiary of the ITDC, on February 5, 2019. The International Tribunal for the Disappeared of Canada (ITDC) is an international coalition of jurists and human rights groups.The ITDC was formed in September of 2018 with the aim of investigating the disappearance of aboriginal people in Canada and prosecuting those responsible. The ITDC arose because of continued efforts by the Canadian government to subvert justice by concealing and falsifying the truth of the genocide of native people in Canada, both past and present. The ITDC has three Canadian field offices in Vancouver, Winnipeg and Toronto, and is connected to a central Brussels office at itccsoffice@gmail.com . Its Canadian headquarters can be contacted at disappearedofcanada@gmail.com .